The most common form of malnutrition within pets in the UK is the overconsumption of calories leading to obesity. It is estimated that 25 to 30 per cent of cats in the UK are obese. 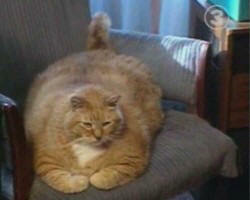 'Obese' cats are those that are at least 20 per cent heavier than the optimal weight due to excessive fat accumulation. A cat is 'overweight' if it is one to 19 per cent heavier than the optimal weight. Ideally, cats should be fed to maintain their optimal bodyweight. Long-term studies have shown that both obesity and excessive thinness shorten life expectancy. Bodyweight can be used to assess whether or not a cat has gained or lost weight. However, dictating a weight which is ideal depends on the age and breed of the cat. Therefore, a scale assessing the body condition (body condition score, BCS) is often used. This scale grades the body condition of the cat from 1-9, where a BCS of 1 is emaciated, 5 is ideal and 9 is obese. An obese cat is one in which the ribs are hard to feel as they are covered by a thick layer of fat, there is a moderate to thick layer of fat covering all the bony prominences, and the cat has a pendulous ‘skirt' (bulge under the abdomen), with no waist. When looked at from above, the back is broadened (see picture on the right). The age of the cat has also been related to the prevalence of obesity. Cats under 2 years of age, are less likely to be overweight, whereas cats between 2 and 10 years require less energy and are, therefore, more likely to be overweight. Geriatric cats (cats of over 10 years of age) tend to be underweight. It is dangerous for cats to lose weight too quickly because this predisposes them to the development of hepatic lipidosis, a potentially fatal liver disease whereby fat is deposited within the liver as a result of a change in metabolism during fasting. A gradual, steady decrease in bodyweight is ideal; it may take up to a year for a severely overweight cat to reach its ideal body condition. The veterinary surgeon can draw up a weight loss programme that combines a suitable feeding and exercise plan with careful monitoring. It is very hard to see weight loss in a cat that you are in close contact with on a daily basis. Regular visits to a veterinary surgeon for weigh-ins will also ensure that weight loss is not too rapid. Cats are carnivores and, unlike humans and dogs, they must have meat in their diet to survive. A cat's natural diet consisting of small prey mammals would be high protein and low in carbohydrate. In order for cats to lose weight, veterinary diets have been designed which are high in protein, low in fat and low in carbohydrate. This helps cats to lose fat whilst maintaining lean body mass (ie, muscle). In addition to a suitable diet, cats can be encouraged to exercise either through increasing play, or by encouraging movement around the house (walking up and down stairs either by using a pet harness or by moving feeding bowls etc. ).